SOULFLY will embark on a European headlining tour in early 2016 in support of the band's latest album, "Archangel". Says SOULFLY mainman Max Cavalera: "Now it's Europe's turn to have a taste of the 'We Sold Our Souls To Metal' tour 2016. It's gonna be epic and unforgettable. Plus, we got LODY KONG, INCITE and KING PARROT. No stone will be left unturned. Prepare your metal head, we'll see you in the pit!" SOULFLY tapped Mike Leon (HAVOK) to play bass on the band's recent North American headlining tour. Leon said: "I've been a fan of Max and his music since I was a little kid, and to be playing with him and the guys now is truly unbelievable!" 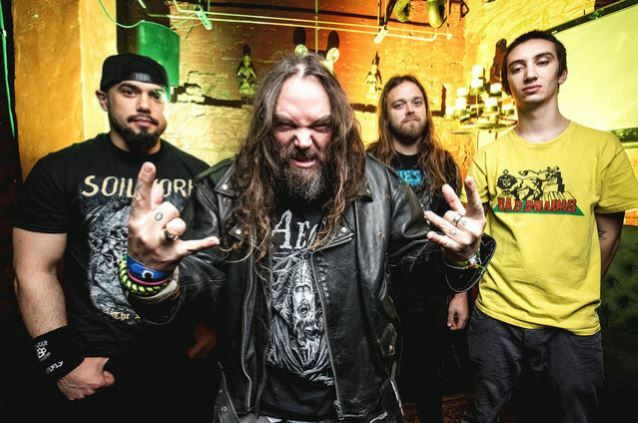 Handling bass duties for SOULFLY during some of the band's shows earlier in the year was Max Cavalera's son Igor, who also sings for the Phoenix, Arizona band LODY KONG.